Yellow & Black! The lads are up and about and my prediction we’d play finals footy is getting closer. Still work to be done but optimism is growing! Update: Would you believe it. The Tigers are now 9-4 after two great wins in a row since my prediction below. The last win, I was lucky enough to be at the MCG. The Tigers smashed the Saints after an even first quarter. June 15th: I’m going to to do it. I’m going to mock my beloved Richmond Tigers for another AFL season. But, I’m impressed with this year’s crop of Tigers. We will make the finals first the first time in … forget about how long, we’ll make the finals. Beating the West Coast Eagles at Subiaco two weeks ago and then beating the Adelaide Crows today at the MCG has the Tigers poised for a pretty strong next week four weeks; Western Bulldogs, St Kilda, North Melbourne and the Gold Coast. Tonight, we are 7-4 and in The Eight. 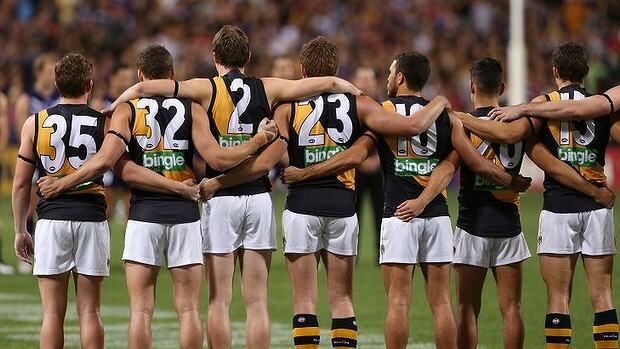 11-4, surely, the Tigers can’t be 11-4 in season 2013. They will be because we’ll our next four straight. I remember when we won the grand final in, the pain, 1980. Well, I’m not saying we’ll be winning the flag but I am saying we’ll be playing in September and for a lifelong Tiger fan, that is something that hasn’t happened in a while.